Vailsburg County Park in Newark, NJ is a rather tranquil spot well suited to passive recreation and a game of baseball. The loudest sound in the park is the roar of traffic on the nearby Garden State Parkway. However, at the turn of the 20th century the roar you most likely heard was the sounds of people having a good time at an amusement park named Electric Park and the crowds thrilling to the motorcycles going full throttle around the adjacent Vailsburg Motordrome-a motorcycle racetrack. Electric Park had its beginnings in the 1860’s with the help of the German beer baron Gottfried Krueger. In this park local German- Americans could practice shoot, hold athletic contests, dance, listen to music, eat and drink. By the end of the 19th century,times and tastes were changing and young people did not care for the genteel Victorian amusements of their parents. Coney Island in New York now had mechanical rides and the public was excited. People of all ages clamored for a similarly exciting experience in their own local amusement parks. 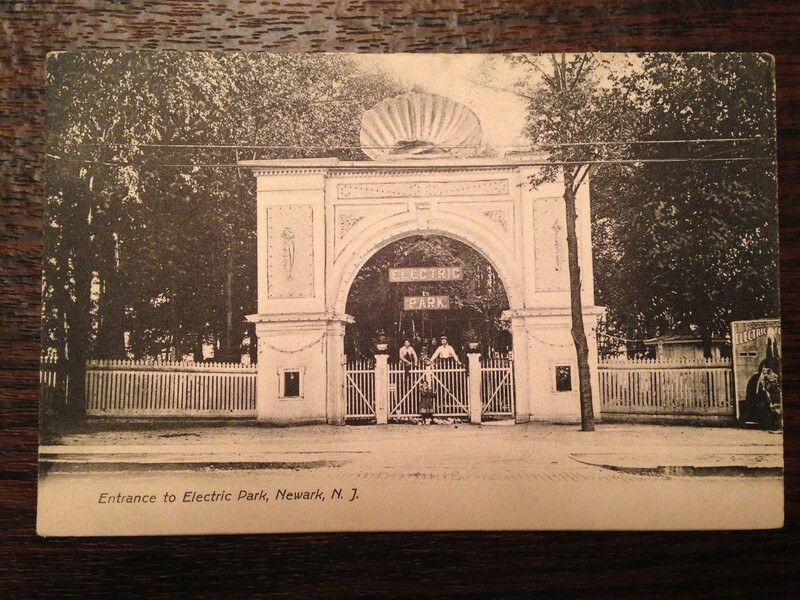 So on Mem0rial Day 1903, the amusement park now renamed Electric Park due to the extensive use of electric lighting , reopened with new attractions. Among these attractions were a carousel, a toboggan slide, a dancing pavilion, open air theater, a zoo and a fountain and entry gate festooned with electric lights. Electric Park’s owners and promoters realized the public was seeking ever greater thrills. 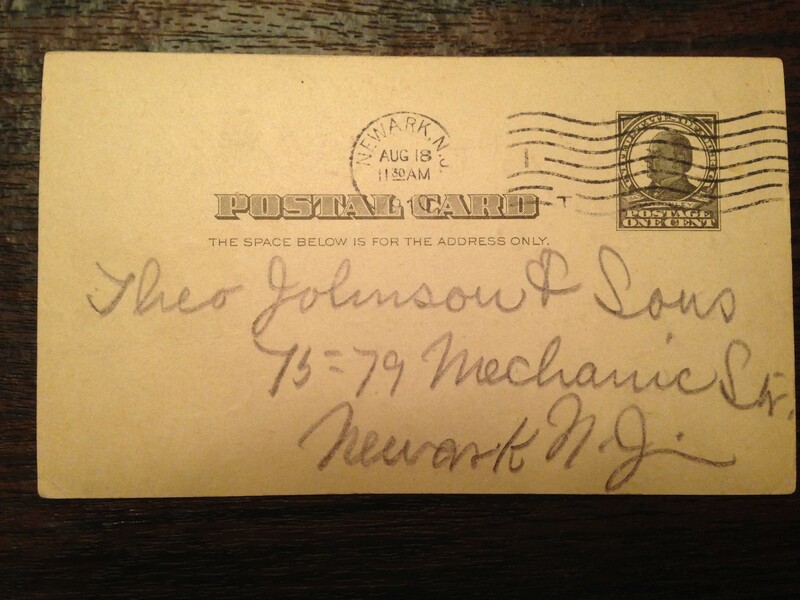 Their answer was a motorcycle racetrack – a Motordrome. The 8,000 seat Vailsburg Motordrome opened on July 4,1912. Mayor Jacob Haussling fired the starter pistol for the first race. The Motordrome, except for the steeper banking, was similar to the 12,000 seat Vailsburg Velodrome across the street, where the Speedway School now stands. On Sunday afternoons, the stands of the Motordrome were full of paying customers who would ring the 60 degree , quarter mile wood planked saucer shaped track to see nationally renowned motorcycle racers compete at speeds up to 100mph. As the Motordrome gained in popularity,storm clouds were gathering on the horizon against both the Motordrome and Electric Park. On July 16,1912 the Vailsburg Improvement Association, long an opponent of Electric Park, filed a complaint in Newark Municipal Court. Then on September 8, 1912 at 5:15 p.m., as if on cue, fate dealt the Motordrome and Electric Park simultaneous and fatal blows. This was due to a horrific accident at the Motordrome which left two drivers and six spectators dead. The ensuing public outcry and government action didn’t immediately destroy the venues, but the die was cast. These fateful events unfolded when nineteen year old, Eddie Hasha, a world champion racer from Waco,Texas, lost control of his motorcycle which was traveling in excess of 92 mph. His motorcycle rode up to the rim of the bowl and crushed the skull of four spectators leaning over the rail. His motorcycle then struck a support column and Hasha flew off the bike into the stands, his neck was broken and he died instantly. The rear wheel of his motorcycle flew off and injured one person in the crowd who later died. Another fan in the bleachers was also injured and died.The motorcycle , now driverless, slid down the embankment and struck another racer, John Albright who died five hours later in City Hospital. On December 28, 1912 Newark’s Aldermen responding to the popular press and the portrayal of Motordromes as “Murderdromes” banned motorcycle racing in Newark. This ban remains to this day. On October 26, 1912 , a grand jury cleared the Motordrome owners of criminal negligence. Civil suits were settled for $328.00 on January 15, 1914 in a judgement against EMRA-Eastern Motorcycle Racing Association. The Motordrome was sold at a sheriff’s sale on November 14,1912 to satisfy a $10,895 lien held by Zacher and Currie the carpenters who built the track. On September 12,1915 a fire leveled the Motordrome. The Essex County Park Commission hired a wrecking company to clear the remains of the Motordrome and the adjoining Electric Park in 1917. Thus, Vailsburg Park was created. The two postcards I have placed in this blog pertain to Electric Park. One card shows the electrified entrance on South Orange Avenue. 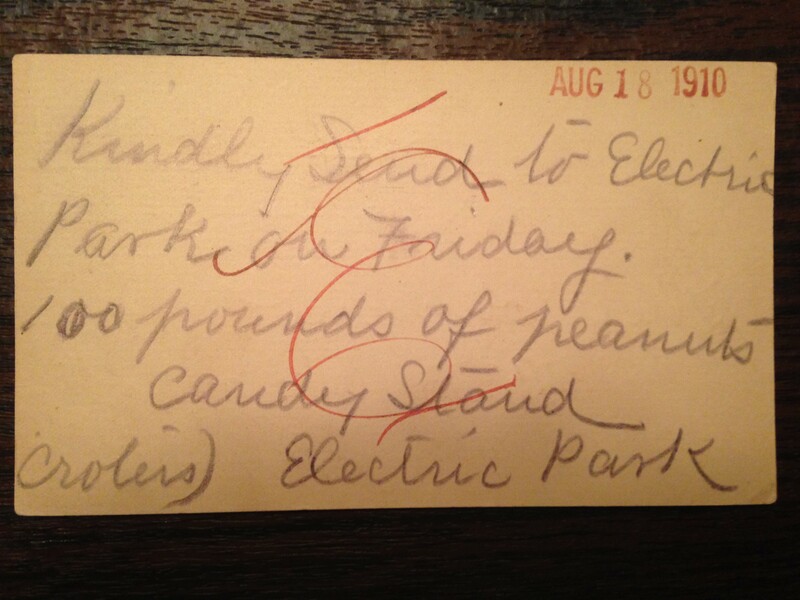 The other was sent to the Newark provisioner Theodore Johnson & Sons requesting 100 pounds of peanuts to be delivered on Friday, August 19,1910 to the park’s concession stand. For those that pass by or are familiar with Vailsburg Park I hope you find this interesting. Very interesting. I owned a home in Vailsburg in the 80’s & am very familiar with Vailsburg Park, but had no idea that Electric Park ever existed. I’m so pleased that you learned something you didn’t know about a place that was familiar to you. Comments such as yours make this endeavor worthwhile. Thank you. Mechanic Street is now Known as Edison Place. I am a current resident of Vailsburg & have been so since 1979. I am at awe to discover the hidden history of my home. Thank you for this information. I’m pleased you found my website. It’s always fun to see familiar things in a new light. I hope you visit again. I have an old photo of an unidentified Jersey grocery store which happens to have a placard in the window advertising upcoming races at “Vailsburg Board Track”, featuring a match race between Jay Eaton vs. O.L. Stevens. Purse of $150. Admission 25 cents. I’m going to list it on Ebay soon. Keep watch if you can use it. LET ME KNOW WHEN YOU POST IT AND THE CATEGORY. THANKS !! I was born and raised In Newark on 10th street 12 Ave. My father used to walk me there when I was so young that I remember my arm with straight up in the air holding on to his hand. In My youth I used to fly kites, play Baseball, Ice skate in the Winter, and attend teenage dances In the same location where there is now a soul or field on the South side of the park. I grew up on Munn Ave and spent a lot of time in the park. I recall my Father told me that during the war the park had barracks for soldiers and after the war he and a friend salvaged some of the wood to build a house. Other memories include little league tryouts, baseball, football and running the road that ran around the field. There also was a large playground with two large sand boxes. When we got older the park was closed and patrolled at night by park police. One past time was to get the police to chase us and then hid in the perimeter woods.